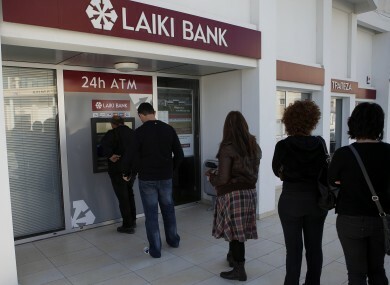 People queue to use an ATM machine outside of a Laiki Bank branch in Larnaca, Cyprus after hearing news of the bailout deal which involves a levy on their deposits. EUROZONE FINANCE MINISTERS have agreed on a €10 billion bailout package for bankruptcy-threatened Cyprus which will involve a near 10 per cent levy on all bank deposits over €100,000. People with less than €100,000 in their bank accounts will have to pay a one-off tax of 6.75 per cent while those with more will pay 9.9 per cent under a measure that will raise €5.8 billion in additional revenue. Cyprus will also be forced to sell off some €1.4 billion in State assets and raise its corporate tax rate from 10 per cent to 12.5 per cent, the rate currently levied by its fellow bailed-out eurozone nation, Ireland. BBC News quotes a European Central Bank official as saying that Cypriot authorities have already started to take action to ensure that the levy is collected before depositors can withdraw their funds to avoid it. Officials fear that there could be a run on the country’s banks when they reopen on Tuesday after the bank holiday weekend but pictures from the country already show people queuing at ATMs to withdraw funds. The deal comes after Cyprus requested international assistance last June having become badly exposed to the Greek financial crisis. It now becomes the fifth eurozone country to enter a programme of financial assistance and the fourth to take on a full sovereign bailout. It had been thought that the deal would involve the EU/IMF ploughing some €17 billion into the country but ten hours of talks late last night and early this morning among EU finance ministers in Brussels saw a deal reached. The belief was that a €17 billion bailout would have increased the country’s debt burden to unsustainable levels as it would have equalled the total annual output of the economy. The International Monetary Fund managing director Christine Lagarde, who was involved in discussions, said in a statement: “I welcome the agreement reached today to address Cyprus’ economic challenges. “The IMF has always said that we would support a solution that is sustainable, that is fully financed, and that appropriately allocates the burden sharing. Russia could also contribute to a portion of the bailout by extending the repayment term of €2.5 billion in financial assistance that it has already provided to Cyprus. In a joint statement the eurogroup said that it expected the board of governors of the European Stability Mechanism, the eurozone’s permanent bailout fund, to approve the financial assistance to Cyprus by the second half of April. Email “Bank deposits hit as EU/IMF bailout for Cyprus agreed ”. Feedback on “Bank deposits hit as EU/IMF bailout for Cyprus agreed ”.